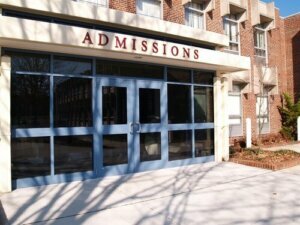 College admissions building. Photo courtesy of Shutterstock. Here’s a question: How many times have you used Google to search for something? Here’s another question: How many times have you read reviews online about a product or a restaurant and made a judgment simply from reading those reviews? You may have even decided not to go to that restaurant or not to buy a product you were previously interested in solely because of reading information online. If you’re like the majority of the population, then one, you’ve searched Google thousands upon thousands of times, and, two, at one point or another you’ve also made a decision about something simply based on what you’ve heard about it online. The fact of the matter is that we live in an increasingly digital world and that’s fundamentally changing our judgment processes. A couple facts to consider. The number of individuals using the internet has increased tenfold since 1999. Last year, it was calculated that Americans spend approximately 23 hours per week either online or texting. On the social media front, the number of people using Facebook and Twitter and other social media outlets — and their time spent on these sites — has exponentially increased over the past five years. To give you one last statistic, in a 2013 survey, 90% of customers who were questioned stated that online reviews — whether read through social media or on online review sites — influenced their purchasing decisions. This last statistic relates to consumerism. However, the power of the statistic really translates to a whole host of other industries and other aspects of life, like employment, dating — and yes, university recruitment. Over the last five years, how university applicants appear online — whether they appear negatively or positively — has become an increasingly influential factor in determining a university applicant’s chances of getting into the university of their choice. In fact, an entire industry has sprung up over the past five years as a result of the fact that an individual’s online reputation, or in other words, how a person appears online, has become so consequential. It’s an industry called online reputation management, or ORM, and online reputation management companies help everyone from job seekers to businesses to university applicants. Students applying to a university, as well as parents of those students, should know what online reputation management is. After all, 26% of university admissions officers use Facebook to learn more about students during the admissions process. Meanwhile, 27% of admissions officers use Google to learn about prospective students. And 35% of admissions officers found information on Google or Facebook that negatively impacted prospective students’ applications. Those are significant numbers and that’s why students applying to a university should do a search of their name on Google and proactively check their online profile prior to beginning the university application process. If negative information is found online, students can either try to fill their online profile with new positive information themselves, or, alternatively, they can call on the expertise of an online reputation management company. Many individuals — students included — feel that what appears about them in online search results is permanent or cannot be changed. The reality is that search engine results oftentimes can be improved, especially with the experienced guidance of an online reputation firm. Students now applying to a university should know this and take early, proactive steps to improve their online profile as much as possible before their application lands on a recruiter’s desk.